Indonesia's disaster agency says the death toll from the weekend tsunami has climbed to 373 as hundreds of military personnel and volunteers comb debris-strewn beaches Monday looking for survivors. Disaster agency spokesperson Sutopo Purwo Nugroho said Monday that at least 1,459 were injured in the disaster and the death toll was certain to rise further, with 128 people still missing from the affected areas along the coastlines of western Java and southern Sumatra islands. 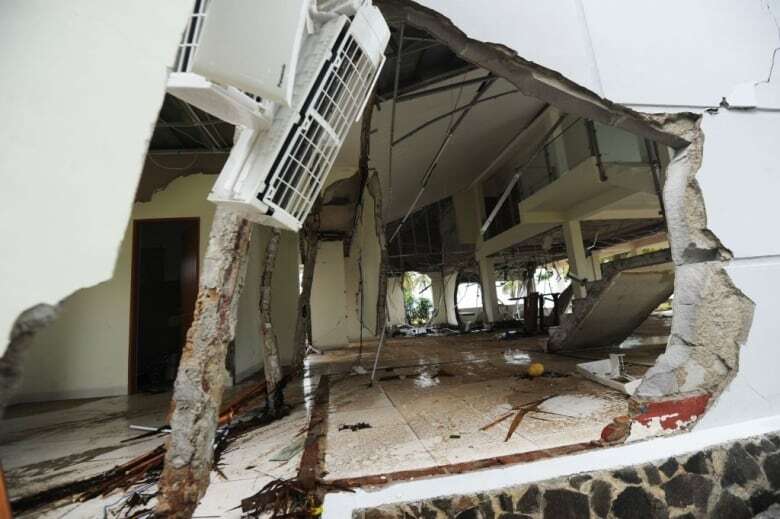 The Indonesian Medical Association of the worst-affected Banten region said that it sent doctors, medical supplies and equipment, and that many of the injured were in need of orthopedic and neurological surgery. It said most victims were domestic tourists who were visiting beaches during the long weekend ahead of Christmas. 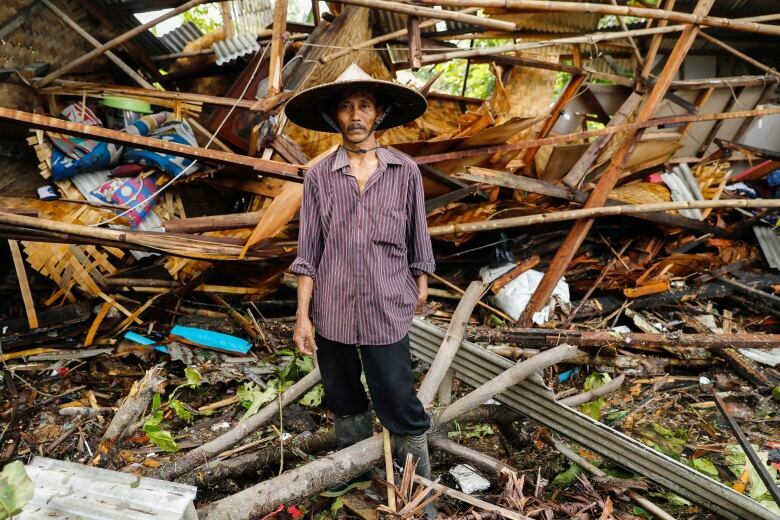 "I heard people shouting to run away, and I saw the water had gone up to the mainland and the hotel had been flooded by water," said witness Feri Ardian. "About 200 people were dragged away by the waves." Dramatic video posted on social media showed the Indonesian pop band Seventeen performing under a tent on Tanjung Lesung beach at a concert for employees of a state-owned electricity company. A wave smashed through the makeshift stage, tossing the band and its equipment into the audience. "The tide rose to the surface and dragged all the people on site," the band said in a statement. "Unfortunately, when the current receded, our members were unable to save themselves while some did not find a place to hold on." Seventeen's bass player, guitarist, drummer, road manager and technician were all killed. The lead singer, Riefian Fajarsyah, survived, but his wife, who was also a backup singer, remained missing. 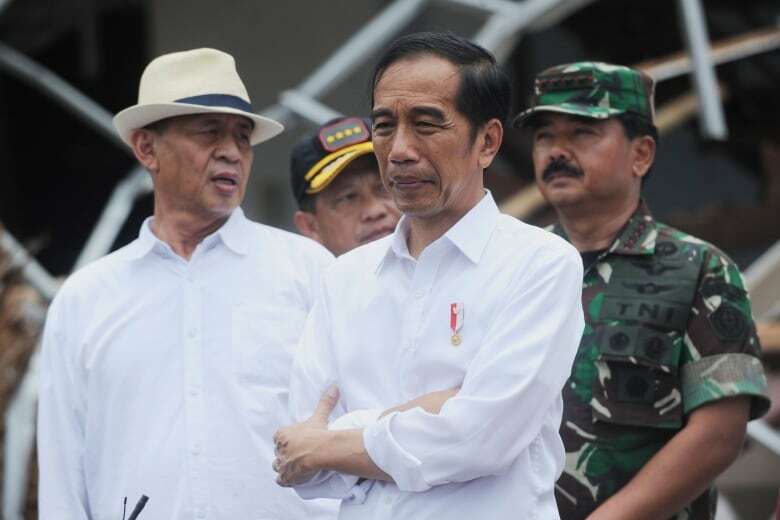 Indonesian President Joko (Jokowi) Widodo expressed his sympathy and ordered government agencies to respond quickly to the disaster. A spokesperson for Global Affairs said in a statement that consular officials are ready to assist Canadians, if needed. "Canada is deeply saddened by the tragedy caused by the Sunda Strait tsunami in Indonesia. We offer our sincerest condolences to the families and loved ones of those killed and wish a swift recovery to those injured. We are not aware of any Canadians who have been affected," the statement read. 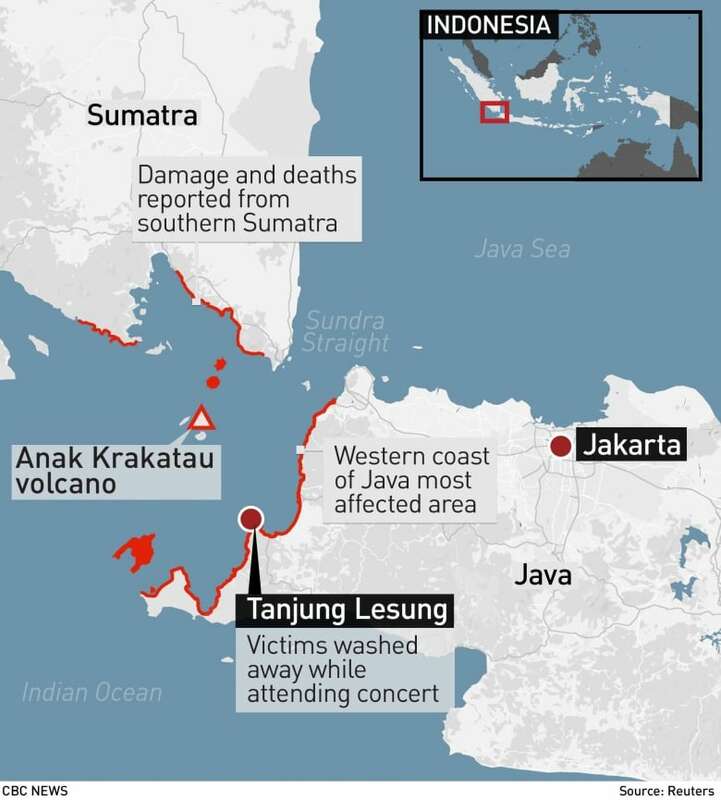 A very shocking and tragic situation in Indonesia - today we send condolences to everyone affected by the tsunami that caused so much devastation on the Sunda Strait. Canadians’ thoughts are with you &amp; our government is ready to offer assistance if needed. In addition, Prime Minister Justin Trudeau offered his condolences in a tweet on Sunday and reiterated Canada's offer to assist. Kathy Mueller of the Canadian Red Cross told CBC News Network that aid workers are trying to reach some areas cut off because of debris. "They are sending in five mobile health clinics. So once the roads are cleared a little bit more, these mobile health clinics can get into these remote areas and provide treatment right on the ground," she said from Sulawesi. The head of Indonesia's Meteorology, Climatology and Geophysics Agency, Dwikorita Karnawati, said Monday the tsunami was caused by Krakatau's volcanic activity, so could not have been picked up by her agency's sensors, which monitor the conventional tectonic earthquakes responsible for more than 90 per cent of Indonesia's tsunamis. 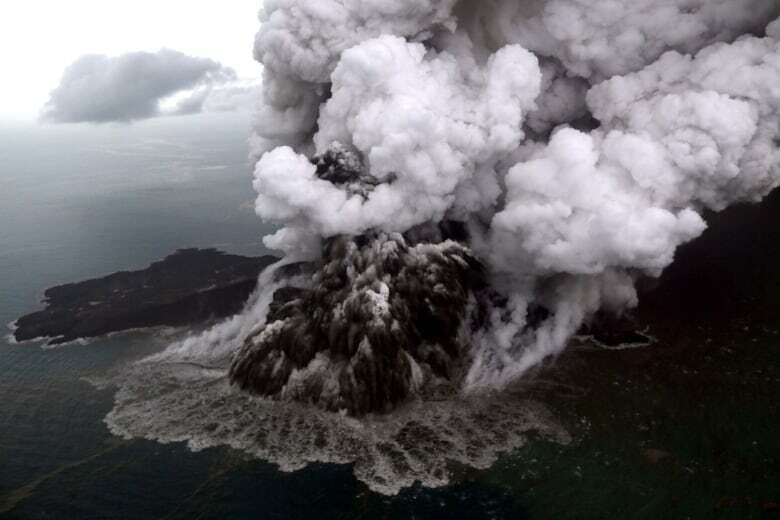 Scientists said the tsunami could have been caused by landslides — either above ground or under water — on the steep slope of the erupting Anak Krakatau volcano. The scientists also cited tidal waves caused by the full moon. The 305-metre-high Anak Krakatau lies on an island in the Sunda Strait between Java and Sumatra islands, linking the Indian Ocean and the Java Sea. It has been erupting since June and did so again about 24 minutes before the tsunami, the geophysics agency said. "Actually, the tsunami was not really big, only one metre," said Prasetya, who has studied Krakatoa. "The problem is people always tend to build everything close to the shoreline."